Thailand overall, and Bangkok in particular, is a land that has been shaped and influenced by many different countries and cultures. But from a religious standpoint, the predominant mix is Buddhist-Hindu. For all those who go on a religious sightseeing tour in Bangkok, this is a rather plain looking (compared with the many temples), but nonetheless significant place of worship in Bangkok. 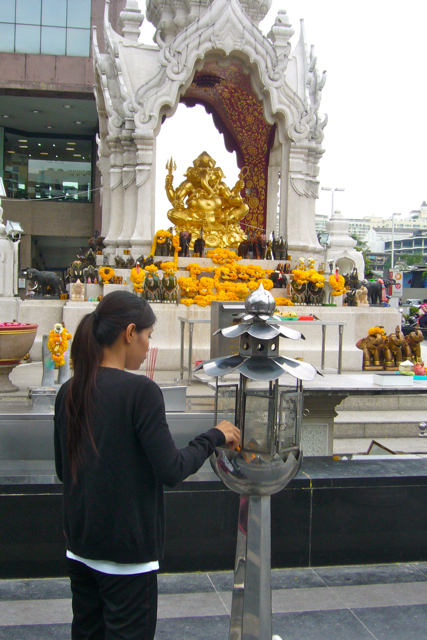 A lot of Buddhists go to pray and worship at shrines of Hindu deities, and this Ganesha shrine is one of the most popular in Bangkok. In Indian mythology, Ganesha is the son of Shiva and Parvati, and most easily recognized by his elephant head. In particular artists, actors and those who pursue creative professions worship to Ganesha, who enjoys dancing and good food, because he is the patron of arts and sciences. Actually Ganesha is the diety who helps to destroy obstacles, but artists always prayed to Ganesha before they did carvings in temples. For when they carved, they essentially destroyed those pieces of stone or wood that covered up the final image they wanted – and that process of destruction was where they requested Ganesha’s help. This is, according to many historians, one of the main reasons why Ganesha is so closely associated with the arts nowadays. If you wonder why Ganesha has an elephant head – it is because his father went on a long journey for many years, and when he came back, he saw his wife with a young man in his house. Angered at the betrayal, he decapitated the young man – only to be told by his wife that this young man was their son, who had grown up from a small boy into a man in the years during which Shiva was away from home. Shiva then exclaimed that he will put the head of the next living being that walked by on the head of his son – and that so happened to be an elephant. However, there are many other stories about how Ganesha got his elephant head, but this is the most widely known.